This week’s blog is about function keys, and what we’ve done with them. I’ll talk about less frequent used keys, what keyboard layers are and what we’ve done with them. If you’re not interested in context, just skip to the heading: Wooting’s Function Layer and skim your way down. As always we’d really appreciate your opinion. So don’t be shy, give a shout, even if it’s negative, we take everything in consideration and always reply with a smile. Wait, wait, wait. Did we tell you, that we have backlit keys? By far the biggest dilemma in the keyboard world is that everybody has their own preferences. May it be the keys they use, the ergonomics, the layout (ISO, ANSI), the keyboard shortcuts (…) you know where I’m heading, nobody is the same. The first question we asked ourselves was, which keys are (nearly) obsolete and what can we do about it. When we asked on Geekhack about useless keys on a keyboard, there were some interesting results. We could conclude that a majority of the modifier keys and other keys starting right from the enter key, are becoming obsolete. Read: becoming. It’s not quite there yet, some users would (for example) still actively use the Insert to page-down key cluster. Since we’re not building an Apple product, we can’t force people to start using a new standard. So the question became: how can we make sure less frequent used keys were not going to be dead weight. 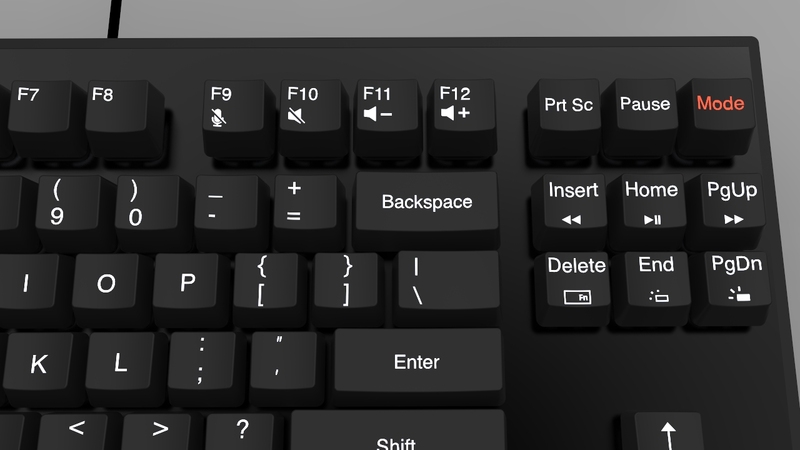 A keyboard can exist out of different key layers that you can access through your modifier keys, most popular being the function key. The function key layer is the most common key multiplier, especially on laptops. Used for such things as media keys and other nifty actions. This concept is really brought to its limits on a 60% mechanical keyboard. Great fun, but also a bit confusing when you just get started. For our keyboard, we wanted the keyboard function keys to be done a tiny bit different. Before I start to explain all the functions, I want to let you know that this is our initial take on the function layer. By no means are we forcing you to follow our layout. If you have your own preference, I’d definitely also check out the “Everybody has their own keyboard shortcuts” chapter. At first glance, nothing newsworthy. We deliberately chosen for this function layout, because (we believe) it’s easy and comfortable to manoeuvre with your right hand. In our experience we never activate function keys in the heat of the battle and during gameplay you don’t want to be maneuvering a W(+shift) (always keep moving) with a Fn+media key with your left hand. Leave that to your right hand, while you keep walking with the left. Now.. we don’t like the whole manoeuvre of pressing Fn+other key to activate media keys. It takes more time and effort than the dedicated media keys you can find on other keyboards. But these keys just take extra space and need goku level presses to activate. We don’t like that… at all. 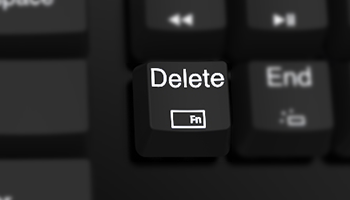 That’s why we’ve come with a new function on the Delete key. We call it “Function Toggle”, it only affects the media and brightness keys. Basically, it will swap the media and brightness keys with the first keyboard layer. You can activate it by pressing Fn+Delete key, then it will change from a white backlit to a red backlit key, so you can see that it’s activated. In other words, this means you don’t have to (for example) press Fn+PgUp to play the next track. Instead, you just press the PgUp key directly and it will play the next track. Still want to use PgUp? You can now activate it by pressing Fn+PgUp or just turn off the Function Toggle with Fn+Delete. Noticed how we just removed these less frequent used keys, makes sense right? We threw out scroll lock and menu key, sorry guys, but this one just had to go. If you really love the key and can’t live without it, then better check out the “Everybody has their own keyboard shortcuts” chapter. To be frank, this key plays a role in our mind shattering next generation feature, but we’ll not cover that in this blog. It requires a lot more explanation. 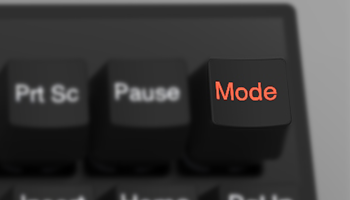 The Mode key basically changes your keyboard profile in either Typer- or Gamer’s mode. We made this distinguishment, because when you play a game, you have different expectation from your keyboard than when you’re coding the next highly featured product hunt app. No, it’s not a sugar coated “windows lock” feature. Congratulations, the keyboard is an actual keyboard. Everything we’ve covered until so far works as it should. Oh, and the logo keys are windows keys. Do you have your own typing preferences? Then surely check out the “Everybody has their own keyboard shortcuts” chapter. Capslock is actually an amazing key to use in games, but it’s just awful to randomly type caps on chat. So now it’s a programmable key, map anything you want to it. Applications recognize it as an extra key. If you still want to write in capital letters on chat, activate Capslock by pressing the Fn+Capslock keys. 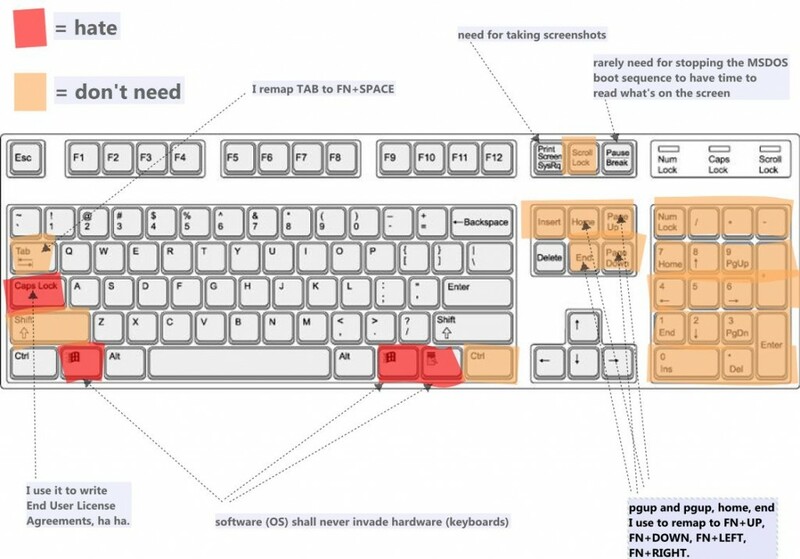 Fn key too far away? That’s why we’ve changed the left logo key into a Fn key. Additionally you can start mapping Fn+other keys in games, or macro applications. Lastly, it will activate a next generation feature that we’ll be covering another time. In fact, we’re not here to dictate you on what the best keyboard solution is. We just give it our best shot without requiring a lot of user knowledge and experience. On the surface it has to appeal as a no-nonsense and clean design keyboard with gaming at its core, that you can use in both home/private as in a public/office setting. But once you dig deeper into the keyboard, you’ll find that the keyboard has a lot more capabilities. Unlike many other gaming keyboards out there, we’re building the keyboard firmware from the ground up by ourselves, and we can do with it, whatever we like. And we love customizability, open-source projects and reaching out to the community. Isn’t that the world we live in now? User created content; the freedom to use your creativity. It’s too early for us to share how this perspective of ours will exactly translate into reality, but you can already imagine that we’re going to give you the freedom to map this keyboard however you like. Did we miss anything, do you have a favourite function, don’t like the function keys, rather see another layout or any other opinion? That’s where you step in. Share your opinion with us. We’d really appreciate it! Next week’s blog we’ll cover all the feedback we’ve received until so far, and let you know what we’re doing with it.